Enjoy Deeper Connections. Live Authentically. Are You Ready to Lead a More Fulfilled Life? For the first time ever, I have created the most in-depth, professional and intuitive training courses on the market. I decided to developed this course in response to many requests to make these tools available for everyone. 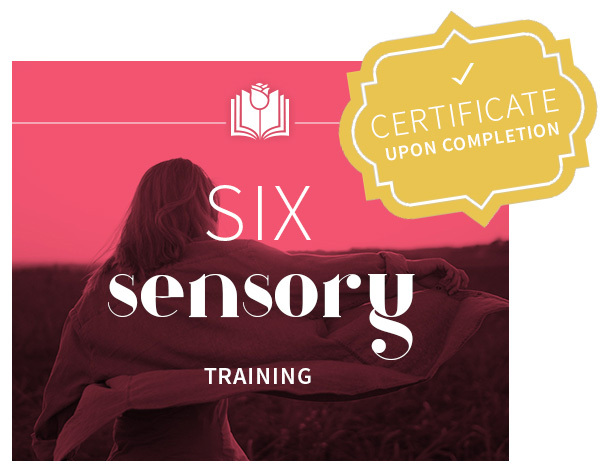 This ground-breaking Six Sensory Living course will give you ethical guidelines to enhance your overall well-being. I’ll give you in-depth guidance to lead you to a more successful and fulfilled personal and professional life. Plus, you’ll get practical training and professional support. Take this course at your own pace and in the comfort of your own home. I know this will change your life! You’ll no longer feel overwhelmed by the endless to-do lists, or the constantly evolving articles to read, or the multitude of people to catch up with. Your intuition will stand by you and guide through each and every moment of your life. The next best step — from finding the car keys you misplaced, to the parking spot you badly need, or even the next business opportunity that will change your fortune — everything moves into your perception with ease and grace. People with a developed sixth sense are able to manifest creative solutions, solve problems and even “pick the right answer”… way beyond the probabilities of chance. It’s often said that intuition and inspiration are two sides of the same coin – so as you get better at hearing your intuition, don’t be surprised to feel inspired, generate money-making ideas and solve problems … with ZERO stress. Imagine meeting someone for the first time and knowing in a heartbeat if they’re trustworthy (or not). Imagine if you could sense when someone is lying to you. The better your intuition, the more you’ll be able to read people & situations quickly and accurately, and the more you’ll find yourself instinctively “making the right choice.” Imagine the positive impact on your relationships, career, finances, happiness… and in every important area of your life… when you consistently make the best decision. Picture this – you want to figure out a way to make an additional $1000 a month. Rather than fretting about what to do, you simply ask your intuition for guidance… and let go. Almost immediately, you start to receive guidance. You have a clear sense of what to do. You “attract” the money you need. It seems strange, but it’s been proven that people who tune into their intuition make more money. Best of all… your intuition is simply the whisper of your highest and most authentic self. This means that the more you follow your intuition, the more you’ll live in alignment with your highest self. You’ll start living with more integrity, personal power, and overall fulfillment. Plus, every time you follow your heart you’re one step closer to living your life purpose. Imagine that! It’s an in-depth course that gives you plenty of exercises that challenge your way of thinking and nurtures you on a path of controlled and functional intuitive awareness. Download 6 mp3 songs – The same songs I play at the in-person training. Watch over 70 lessons (25+ hours) of web HD quality! Access 3 never before released meditations. Email Reading directly from me!!! That’s right, I will answer any question that you have. This one time question can be asked whenever you want during the first year of your program. VIEW A SAMPLE OF THE COURSE! I instantly connected with her through the video session, she felt strangely familiar. I am in awe of her amazing gift and ability to show me clearly how to improve my life. The course is identical to what I use to teach at the in person level 1 training, which consists of 30 hours. The course is yours for life. Yes, I offer a payment plan if needed. Can I get a certification from this course? Yes, I will provide you with a certificate upon completion. Yes!! I have had, lawyers, entrepreneurs, teachers, stay at home parents, etc… Take this course. If you are looking how to activate your intuition and apply it at the highest level, on a daily basis. This course is for you! Sonia has such soft and gentle energy throughout this program which is exactly what I need. I feel like a kid in a candy store. I want to binge watch all of the classes at once and soak up everything. You feel like you’re sitting with Sonia having a visit. I really didn’t know what to expect, intuition work is something I recognise as always being a part of me but never really giving it full credit, so I wanted to develop this. It did take a few days for me to adjust after listening to the intro, I suppose it scared me a little and I resisted. Sonia challenges you, but she has a really warm and personable style. Watching the videos now calms me, it’s what gets me up in the mornings, I’m so excited to learn. I was looking to improve my sixth sense. OMG what a great course. This was the best thing I did for myself. The videos are great and I studied at my own pace. I have incorporated into my daily life what I have learned from the course. I have learned to be more centered and view situation and life in a different way but most of all be truly who I am which is love. I would highly recommend this course to anyone who would like to learn about their intuition. Thank you Sonia this is a very well thought out course. Total value of this course is over $1600!